A young girl at an LA daycare centre changed the course of Dr Caren Rich’s life. Caren was practicing as a clinical psychologist and perfumer and to this day rubs shoulders with the rich and famous, but she took off her heels and became a special education teacher working with Autistic children in some of Los Angeles most challenging schools. She is now known as the Autism Shaman. Now Caren is in the middle of her 2nd “making the leap” story as she’s transitioning into retirement. In this episode we talk about how she’s transforming the lives of families through her work and we also talk about the challenges of raising Autistic children, something close to my heart. If you have children with disabilities and you want to “make the leap” you will hopefully find today’s episode a welcome balm for your soul and if you don’t have kids on the spectrum, you will gain a lot of insight into what it’s like to parent a child with Autism. This episode is more about life than business today but that’s what un-careering is about… integrating life and work you love. By night, Caren is an intuitive therapist who works with AWESOME clients who want to transform their relationships. By day, she is a middle school special education teacher in Los Angeles. Practice Radical Self Care: Do whatever it takes to take care of yourself so you can give. You can’t give until you’re filled. Therepy with animals works well for kids who struggle with empathy. Autistic kids flap and do repetitive activities to self-regulate their emotions. The online world makes it possible for Autistic children to make friends. Companies like Yahoo like to hire kids with Autism because they have out of the box thinking. You always have to change it up with kids on the spectrum. Otherwise they don’t advance. Live your fullest life. No regrets. Mentions Dangerous Minds. Caren describes what it’s like working in schools where kids are drug runners and violence is the norm. Creativity is not being prioritised in US Schools. Many poorer schools do not have an arts program. 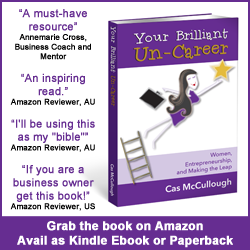 Chapter 11 of Your Brilliant Un-Career talks about overcoming emotional barriers to success. I have done a terrific interview with author and EFT Practitioner Sally Thibault on this topic that I want you to have. Access this interview for free here, along with 32 other business building podcast interviews, templates, worksheets and motivational affirmations.